We have a very cool air mass sitting over us. Even under sunny skies we just barely made it to 40 at the lowest elevations today. The top of the West Hills just scraped above freezing, and at the top of our TV tower (1800′), it stayed below freezing. Drier air has been gradually working its way in from the north and also mixing down from above. Dewpoints are in the 20s all across the metro area and we’ll probably see them even lower tomorrow, down around 20 or even upper teens. Wind will be a non-factor tonight as well with only 1 millibar northerly gradient from Olympia to Eugene and a very light westerly gradient through the Gorge. Watch out for freezing fog later tonight. Tonight we’ll see more FROST on the roads (although some black ice is still possible) since roads will freeze first, then the moisture in the air will go straight to the solid state. With some fog, clear ice is possible too as the water droplets freeze to those cold roads. Not much happening otherwise through the foreseeable future. The only forecast issue next week is whether we get stuck in fog at the lower elevations. Common sense tells me we will, even though mesoscale models don’t show it. I see one forecast sounding for 7am Wednesday shows 20s in the valley, but around 55 degrees at that time at 3,000′. THAT is what we call an inversion. With no significant pressure difference across the Cascades, or north to south for that matter, it’s extremely difficult to believe we won’t get locked into low-level moisture and muck. MAYBE initially starting with this drier air will help…maybe. Other than that, big ridge of high pressure remains over us through the next 10 days while very cold weather plunges out of Canada and into the eastern USA. This entry was posted on Friday, January 11th, 2013 at 5:05 pm and is filed under Weather. You can follow any responses to this entry through the RSS 2.0 feed. Both comments and pings are currently closed. Is there something trying to form off of Vancouver island? That’s what I’m seeing too. Hopefully something surprises us. I’ll be keeping an eye on the radar. Had a low of 25 here overnight. Glad to finally get some winter temps! East coast of US is roughly 20 degrees above normal, more effects of climate change. Walking towards the cliff……not gonna stop until something gets better…..
For stats only: 16 degs at sandy/1,100 ft.
Looks like this was the coldest morning of winter so far on the eastern edge of the metro area near and above the low cloud/fog layer. 21 was my coldest of the season and I see a bunch of teens from Boring to Sandy to Estacada. Wanna talk cold? Check out central/central-southern 0regon temps this morning. Most everything from K-falls to Bend is sub-zero. Chilly 23 this am now too bad we can”t get snow with these cold temps. Aww well maybe next winter. 32 degrees under the dome this is much warmer this morning, heading To the hills to get some sunshine and skiing in should be great times. The low cloud layer has lifted a bit, I was sunny all day yesterday but now I’m in the clouds. Looks like its up around 1,500′ here. Low here 24.5F. Low 20’s and upper teens all over the place. Big concern is the advertised 1030 mb “low” coming down which could saturate the lower levels with moisture, which when combined with big warming aloft, could lead to the Mother of All Stratofogversions. Krahp! It was foggy for a couple hours this morning in Seattle, but it’s burned off to another bright day. Heading out to take a hike this afternoon east of Issaquah. Might as well enjoy the sunshine while it lasts. 17 degs at sandy/1,100 ft.
I’m thinking of moving over here from Russia and cannot decide if I should visit the Pacific Northwest for a spell as I’ve heard it’s been unusually mild this year or should I go to the east Coast on Inauguration Day to screw up any talks about Global Warming conferences just for kicks? Should I do a little bit of both perhaps? Tee hee hee. I’ll let you the public decide the fate of winter!!! Hi Kyle! I like your new alias. Sure, but when the locks freeze overnight, good luck getting in your car. Just went out side, looks like its starting to mist in the fog might want to watch out on the roads !! My temperature has rebounded in the last hour or so from 25F up to 30F, DP 28. I think either some clouds or fog rolled in overhead, I can’t see the stars anymore. I’ve been stuck at 27 for four hours. Up 6 to 31 now… any warmer and everything will begin to melt. Any chance we see any east wind this coming week Rob? I suspect lows in teens will be commonplace tonite in puget sound basin away from water, as dewpoints have dropped into upper teens with low 20’s all over. Note a NE wind has picked in Fraser valley. Sort of a sneak cold. Not thinking Salem will hit forecast low of 22f. Fog never burned off and we did not get the radiational cooling we got last night. I’m thinking 24 or 25 for low. 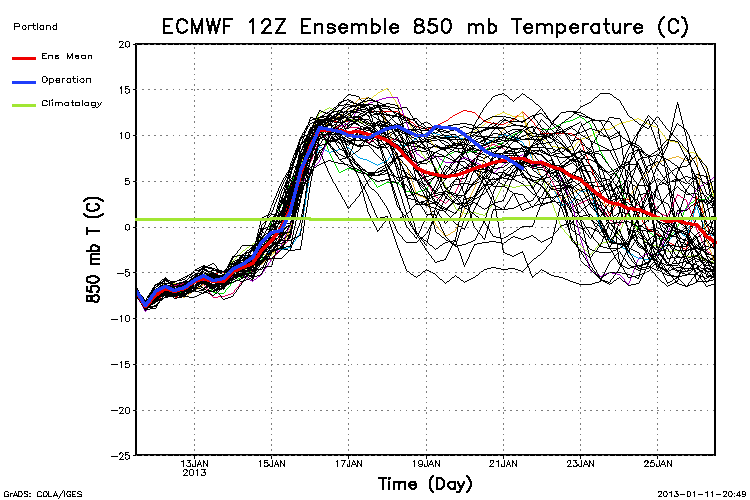 Suppose you never know… Let’s see what the models show in 5-7 days. Temp 25F, DP 25F, incredibly light fog, the whole world is sparkling! .SHORT TERM…TONIGHT THROUGH TUESDAY…AN INTERESTING SIGHT LOOKING AT THE OBSERVATIONS ACROSS THE DISTRICT THIS EVENING. AS OF 835 PM…ALL METARS WERE AT OR BELOW FREEZING. THIS JUST GOES TO SHOW HOW CHILLY THE LOW LEVEL AIR MASS IS…AND JUST ABOUT EVERYONE IN OUR FORECAST AREA WILL DIP WELL INTO THE 20S OR COLDER OVERNIGHT. MEANWHILE FOG IS DEVELOPING IN THE WILLAMETTE VALLEY…AND IS BECOMING LOCALLY DENSE. ODOT WEBCAMS SEEM TO SUGGEST THAT THE FOG IS NOT QUITE DENSE ENOUGH YET FOR A DENSE FOG ADVISORY. GIVEN THE EXPANSE OF LOW CLOUDS WHICH HELD TOGETHER THROUGH THE DAY THE AND ASSOCIATED RE-RADIATION BACK TO THE SURFACE TONIGHT…IT MAY BE A BIT DIFFICULT FOR WIDESPREAD DENSE FOG TO DEVELOP. WITH ROAD TEMPERATURES NEARING THE DEWPOINT IN SOME AREAS THERE SHOULD BE SOME ICY SPOTS AS FROST DEVELOPS. ISSUED A SPECIAL WEATHER STATEMENT EARLIER IN THE SHIFT TO HIGHLIGHT THIS HAZARD. MAY EVENTUALLY NEED A FREEZING FOG ADVISORY IF THIS CAUSES ENOUGH PROBLEMS. REMAIN IN THE FOG AND IN THE 30S FOR HIGHS AS OUR INVERSION STRENGTHENS. IT IS QUITE POSSIBLE VALLEY HIGHS BEYOND TUESDAY MAY NEED TO BE LOWERED AS WELL. COASTAL LOCATIONS AND THE HIGHER TERRAIN WILL GRADUALLY WARM THE NEXT FEW DAYS AS AN UPPER LEVEL RIDGE STRENGTHENS OFFSHORE AND BUILDS INTO THE PACIFIC NORTHWEST. AS THE INVERSION STRENGTHENS WE WILL PROBABLY HAVE TO DEAL WITH DETERIORATING AIR QUALITY…ESPECIALLY AS THE WORK WEEK BEGINS MONDAY. LIFT WILL BE POSSIBLE WITH MSLPS ABOVE 1030-1035 MB AND STRONG SYNOPTIC RIDGING ALOFT. Hahaha! Wow… Is that really even a low? That’s more like a dent in this high pressure ridge. 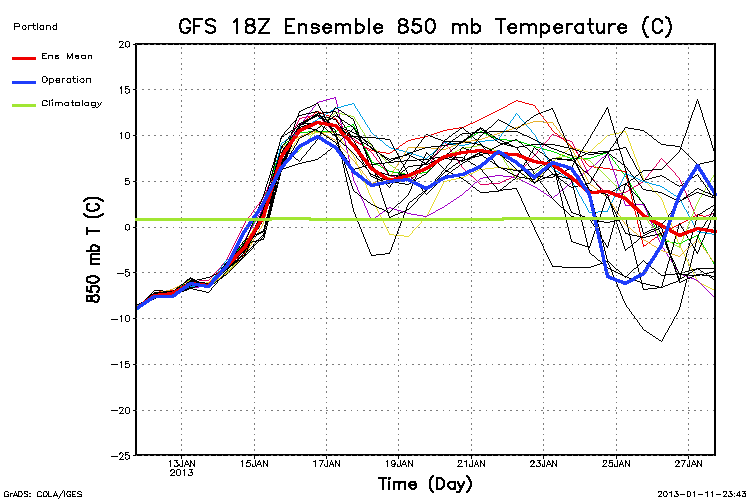 00z GFS said big deal to the 18z, I can do better and now has 850mb temps +8c or warmer for 10-11 consecutive days. Yeah, um let’s get this death ridge out of the way now so when that February arrives we are blasted with historic cold/snow. Good luck with that, and keep wishing! I think our only hope for wintry precip in the near future (possibly for the winter) will be some sort of a transition event once this ridge finally breaks down and moves away. That being the case, we may see a day or two of ZR before this cold air finally gets scoured out of the valley and we return to our normal wintertime pattern of cool, dark, wet. My thinking on this would be sometime during the January 25-31 timeframe. I’ve been saying since the fall, the biggest story for PDX when all is said and done this winter will be ice, not snow. We shall see. I had mentioned last week that I thought this would be the coldest big ridge/fogversion/fake cold pattern since Dec 2005…I think this will be close to that if not colder. You DID pick up the 36 rolls of toilet paper too right? So Mark, if there is marine moisture then why not snow, or is it not going to make it to us? Just curious, or don’t understand. If we get very weak marine influence from the Pacific, this’ll basically be the worst weather pattern in my opinion. Cool highs and average lows, air potentially stagnating, clouds socked in solidly. I’d take rain and 35 over this any day of the week… And I’ve blasted 35 and rainy. Down to 28 already after a high of 34. It’s been awhile now we have not been above 36 for almost a week now. How much longer before were stuck in fog i wonder. I’m sitting at 27, Fairbanks is 29. What’s wrong with this picture? Fairbanks is sitting at 14 with a high today of 16. Lakeview is already down to 20 below zero! Yesterday at this time it was 3° and they ended up at 22 below zero. I know it won’t get down to -55, but wonder if this could be a record-setting night for them. Maybe even the state of Oregon’s record low temperature is in jeopardy. Interesting stuff! I believe the state record low for Oregon is something like -53 °F, so that is in no danger tonight. -54f is the official record. Already down to last night’s low of 27, and it’s not even 7pm. DP is 26, so will probably sock in with fog shortly, or at least see the temperature level off. Barring any replacement with drier air, this is likely it for tonight. Nice to have a dry day, got some things done outside. High of 35, but areas in the shade stayed frozen all day. Avocado is covered with a tarp, picked up a small heater/fan at the Orange Box for $15, got it running on high blowing heated air into the tarp from below, that should protect it from too much freeze damage. Was going to put it inside my storage, but at 12 feet tall that’s no longer practical. Everyone needs to just lighten up, and I’m no exception. Like 95% of the people who post here regularly, I want snow, too. But ya gotta take what ya get. Might as well enjoy the cold dry weather while it lasts; it’s a nice break from how rainy November and December were. Oh believe me, I’m right there with you. I want snow, and I don’t need all that much to satisfy that want, but even when I make casual mention of the frost in my grass like this morning, I still take a hit from some @$$hat who says I’m whining and depressed. If I merely mention that I’m looking forward to the warmth and beauty of summertime, I’m immediately called a pessimist. Someone looks at the long range and says “Wow, that’s really dry all the way out to the end of January and beyond!” and they get slammed for whining? Like I said, people need to lighten up. Judging by the extended forecast, it’s looking like W7’s investment (well… really his neighbor’s investment) in a heater to keep the chicken’s water liquid was a prudent one. The neighbor-chickens are no longer my responsibility, my neighbor came home from Massachusetts last weekend. On that note (bizarre segue), would it be a bad idea to stand out front with my garden hose spraying down my street, just for S&G? It was beautiful, but chilly here today, very similar to last week’s east wind event. Partly cloudy to mostly sunny and a high of 32. NOAA forecast is so redundant! “Areas freezing fog, freezing fog, patchy freezing fog, areas freezing fog, freezing fog …” Fog, anyone? What a COLD day today. I don’t care if it’s fake cold, inversion cold, vodka cold, arctic blast, or whatever, today was every bit as cold as if a modified arctic front had filtered south through Washington and Oregon. Quite impressive…. 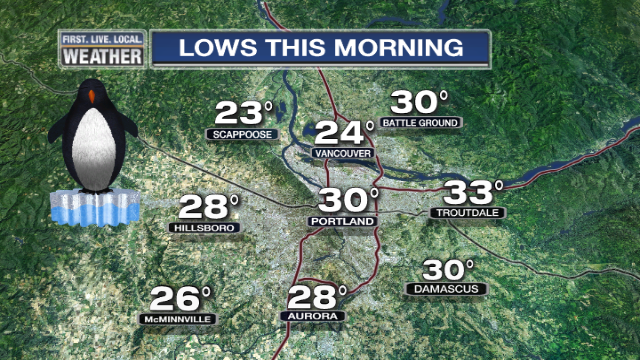 Hillsboro, Aurora, and Salem were all at or below freezing for high temps. Could be more locations to add to this. Cold, at at least up here in Seattle, sunny. Did a lot of bicycle riding in the dry weather today. Might as well take advantage of it. Just have to keep a sharp eye out for all the places where seepage is flowing across the roads. There’s lots of mini-glaciers lying in wait, and if they’re in the shade, they’re not melting. Was the flow aloft supposed to turn N-NE? It is and has. I find this quite intriguing. The ridge is obviously tilting or nosing a bit. Keep an eye on deeper arctic air sliding south out of the Northwest Territories into Alberta/British Columbia as I am wondering if any of that gets into eastern Washington tomorrow or Monday. Depending on the offshore ridge axis and center position it just looks to me like we’re a lot closer to arctic air or a flirtation with it than previously thought. Yes it was. Several AFD’s mentioned offshore flow. LIGHT offshore flow aloft. Thanks–as always–for your vigilance Rob. You are always so good at instilling any possible true reason for optimism. I must say that I can’t help but think what an awesome day this would have been if that former low pressure system would have held together for today. Maybe next time. 26.2′ here in swpdx at the moment. It is fun having a bonafide cold day today. Just got back from an 8 mile urban hike. Here’s to more winter weather! What a cold day out there. Just got home from a softball tournament. It wasn’t too bad when the sun was out, but when those clouds came through midday it was pretty brutal. Wow very cold Denver game right now, pumped for tomorrow GO HAWKS!!!!!!!!!! Shows how fanatical pro football has become. Imagine sitting in the stadium watching that game. Go Jaquizz Rodgers and Falcons! Funny you say that, my wife is sitting 3 rows up from the 30 yard line right now. She hates cold, but loves her Broncos. As a Raven’s fan I can’t really hope she ends this game happy. I don’t think she is real happy right now. Ray Lewis lives for another day. She is not real happy, I’m happy my team won, but sad for her. A bittersweet win.